Mexican Dip is the perfect game day appetizer! This Mexican Dip recipe is filled with black beans, corn, feta, avocado, salsa, and so much more. It's crispy, fresh, and full of flavor! This Fresh Fiesta Dip will be a hit at any gathering. You could even turn this into a healthy fiesta salad! 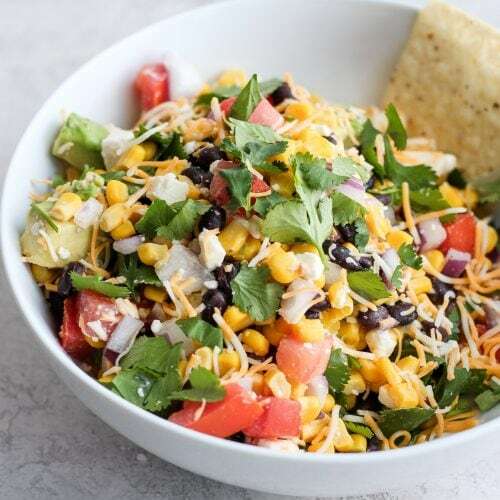 Combine beans, corn, onion, avocado, tomato, feta, and lime juice in a bowl. mix and set aside. In a separate bowl, combine mayonnaise and salsa and stir until well mixed. Pour salsa mixture over veggies and toss with shredded cheese and cilantro.